How to Play GTA San Andreas in Android for Free? HomeGamingHow to Play GTA San Andreas in Android for Free? Welcome to TechnicalRazz. I am Techncialraz. Today I am happy to tell you about gaming. Maximum people have craze of gaming. Everybody likes games of high quality. People like good graphics game. We are spending more money on costly graphics. Games with good graphic can play only on the computer. But the good graphics card should be installed on the computer. But technology is growing day by day so these heavy games have launched for mobile also. Not every game but some computer games have found the Android version. I am telling how to play GTA San Andreas in android for free? Today I am telling about the too famous game of North game. I am telling about GTA San Andreas. This game had launched in 2003. This is the second most famous game of GTA game series. This android version is as good as the computer version. In the mobile version of the game, you can increase and decrease in its graphics. If you have the android mobile with 1 to 2 GB ram than the game can run with full graphics in your android mobile. If you have the android mobile with 1 or less than one GB ram than also we can play this game in our device. The game run with low graphics in the device with 1 or less than 1 GB ram. Every device is mandatory to run this game. This game is about 2.63 GB. This 2.63 GB file is the obb file. We have to keep stored this file into the device storage. We know what is obb files? If you will install this from the play store then you will get this game in 1.83 GB as you can see in the screenshot. If you will download from free than you will get this game is between 2.6 GB. From here you will get advanced graphics. Even you will not believe that you are playing this on mobile. Another part is the cheat of this game. Here two types of cheats are. First is Jcheater and second is Cleo SA. Jcheater is a simple interface. The process of adding cheat is very different from the computer. 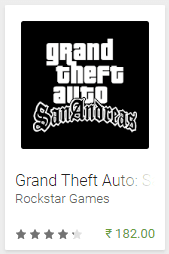 How to Download/Install GTA San Andreas? This is the paid version of the game for android phone. You have to pay ₹183 here. I am telling steps to do it. Step 2: Click the install button and pay₹183 there. Step 4: Now Open this app your game will download automatically. Step 5: After downloading don't forget to heat the finish button. The file downloading is started automatically. The file will save in your obb folder. This is the free version of this game. You have to download it specially. Step 1: Search 'play.mob.org' in your browser. Step 2: Open the true and matched name link. Step 3: Search GTA San Andreas on this website. Step 4: Download both files. Step 5: Install the downloaded app and Install the zarcheiver from play store. Step 6: Open zarcheiver and click on the downloaded zip file. Step 7: Select the Extract option. Step 8: Put extract into storage obb folder. Step 9: Your game will start. By following this both steps you will get the real game. How to download San Andreas cheater? Cheats are the different and attractive thing of GTA game series. So cheat is a very important part of these games. Play the game with cheats is very enjoyable. I have the step to download a cheater. In Jcheater, cheats have already typed. You have to click on it only. Here you can type cheat also. Before playing the game you have to start this cheater. If you do not start it then it will not work. Step 1: Install this by searching JCheater on play store. Step 2: Complete the first mission without using the cheat. Step 3: Save your progress by going to home in the game. Step 4: Open JCheater and click on start cheater button. Note: 1) Start cheater only when you want to play the game. 2) Close JCheater while not playing. 3) If you will not complete and save first mission then you will not get benefit from the cheater. This is a prime cheater for this game. Download and install it from the browser. Because It will not find on any app market. So you may download it differently. Your device should be rooted to use this app. Cleo cheater is a well designed. It is not required to start this cheater. While game playing, you have to drop down your device screen and cheat's interface will automatically open. You will get two options cheat and vehicle. In this cheater so many cheats placed work. You have not seen these cheats in the computer game. You can get about 300 vehicles through cheat. This is the big attraction of this game. Step 2: Download from the first link and Install it. Step 3: Open and install all interface with the install button. 2) Install the all scripts daily. I have written this blog post as per my research and my knowledge. This was play GTA San Andreas in Android. If anybody knows more about this, please tell me in the comment below. If you like this article or If you have enjoyed this article then You should share it at least one time. If you like to join with my blog then you can subscribe us.